On Wednesday, the first Greenfield’s Bagels and Deli franchise opened softly in Greensboro, North Carolina. The same day, Greenfield also announced plans for a second shop to be located at 870 Suber Road in Greer. It’s a lot of change in a short time for the nearly 20-year-old bagel shop, but ones that Greenfield is very excited for. The two new stores are franchises, but as with everything Greenfield has done, they are not bound by pre-set standards. Instead, Greenfield is creating her own approach, and that means while she won’t be the owner of the stores, she will be involved in them as needed, and particularly in the Greer store. The process has also helped Greenfield hone her business model and her original location, which will be undergoing a remodel later this year. Both new stores will carry the same bagel, salads, sandwiches and spreads menu for which the original store has become known. But she wasn’t sure it would actually come true. The growth comes at a time when Greenfield’s has become a household name in Greenville and when Greenfield herself has become a fixture in the community. “Everybody calls me the Jewish mayor of Greenville,” Greenfield said with a hearty laugh. Greenfield’s grew out of a deferred dream to own a small, local breakfast and lunch spot. Greenfield spent her early career making a name for herself in management with grocery stores. She moved to Greenville from her hometown of Miami in 1995 to be an assistant store manager for Publix. She eventually joined the ranks of Harris Teeter, managing various departments from the deli to seafood. It was on a trip, a reward for her success with Harris Teeter, that Greenfield came across a bagel shop and café. That dream at first seemed a stretch, considering Greenfield had no knowledge of how to bake bagels. But, she had to try. 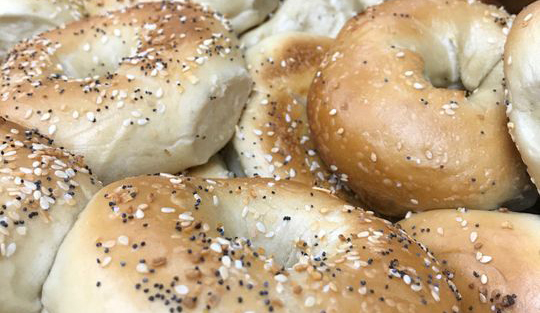 She first looked into a franchise opportunity, which ultimately decided against, but which led to finding someone that could help teach her the art of bagel making. She spent two weeks in Albany, New York learning and perfecting her craft. In 1999, Greenfield quite her job and took $50,000 to open Greenfield’s. The 1,000-square-foot shop was inside the Harris Teeter store on Roper Mountain Road. In 2001, Greenfield’s moved to 101 Verdae Blvd. On Thursday, Greenfield greeted customers with kisses and hugs, asking about children and upcoming trips. Watching her move joyfully about the room, it was clear the challenge with growth will be not in replicating the bagels or the Nova or the pasta salad, but in replicating the spirit Greenfield herself brings. The early years were tough, Greenfield said. Twenty years ago, Greenville was a vastly different place, and there were times when Greenfield felt like an outsider both because she wasn’t a native and because of her Jewish faith. But she persevered, gaining loyal customers with her authentic New York-style bagels and genuine nature, growing a wholesale business and catering, and integrating herself into the community. To this day, Greenfield’s participates in and donates to local schools, non-profit organizations and festivals and events. The store has been the site of Bible study groups, sports team parties and father-daughter dates. Now, Greenfield sees the children of the children that once dined in her restaurant. While growing more locations has always been in the back of Greenfield’s mind, it’s never been a focus. Rather the new restaurants are responses to demands from customers for Greenfield’s near them. The Greensboro location is owned by a longtime regular, Greenfield said, who used to get bagels shipped to him. The franchising has also given Greenfield incentive and opportunity to remodel the original store. She plans to redo flooring, table and chairs and add some Greenville-specific murals later this year. This is also not the end of growth. Greenfield sees more locations to come, and has her sights set on opening a satellite store in downtown Greenville. More stores simply mean more chances to grow her community, her family. “That’s my biggest joy, is that my customers have become my family,” she said before turning to greet another regular customer by name.